It is amazing how, soon as you become a mother who happens to write for a living, the most frequent catalysts for ideas come in the form of what other mothers have said or done. Like a chain of sorts, albeit not the yummy food one, but of actions-reactions and more, that Newton’s IVth Law of Mom-tion spoke about once upon a time. While sharing my thoughts at a mahila meeting recently about how important I consider it to take a toddler for a fun day-out, I was met by a boulder straight from the black and white television era – ‘Our mothers never went out when we were babies. But we grew up just fine!’ Now, who am I to contest that statement, especially in one of those situations where Lord of Reason should keep mum, hide inside my head and finally come out through my pen onto this paper in safer climes – to be shared with reason-able readers? So, here I am about to tell you of the 3 Must-do Ms that we as a family believe in, and you may like to too. When you stay in a city as big as a continent, you cannot help but get exposed to the myriad means of entertainment that it has to offer. So much so that it becomes near impossible to not get carried away, just like your tiny tots. New Delhi has much to offer for every passing weekend, and much more to look forward to for the next one. We decided not to send our toddler to play school before he grows beyond 2 and a ½, but thought of being kind enough to not bore him with just our noses to see. So, we took it upon ourselves to fill up his life with, not just distractions to keep him occupied, but attractions to keep him happily learning about his world around too. And this is what we found – the 3 Ms he loves to frequent, as do we with him. In the initial months post-delivery, when you feel like a Mother Dairy and your husband Mr. Confuse-ious trying his best to do something with his hands and feet and feel helpful, it becomes important to step out and unwind. More so, if the train of well-meaning relatives at home has increased your ‘to-do’ from 10 points to a 100, and doubts about your parenting methods to 1000, from nil. You deserve a break, as does your baby, from getting his cheeks pulled and chin tickled. Malls are convenient and friendly for that stage and age. They offer feeding rooms, centrally cooled surroundings, clean toilet facilities and restaurants to cater to that exact mood of yours. The pram can wheel with ease, and you and your spouse can have a lovely change of scene (of course between changing diapers and feeding times). And going by all the smiles of delight and squeals of laughter that my son used to pass, I’m guessing the lights, the music, the smiling faces, the moving escalator, the jhoola in the lift and all the attention from strangers around is something that he enjoyed, thoroughly. Even now, as a toddler, he has adjusted to the idea of crowds, has developed immense patience as his mother cherry-picks (he’s taking after his father! ), got a hang of table manners in public eating places, and loves to make funny faces in big mirrors of shops just to make people laugh – the last activity being after this mother’s heart the most. Malls and multiplexes are here to stay, and grow. Banish from your heads ideas of consumerism and a few other –isms and go have fun. They have more to offer our children than meets our adult eyes. If the kings of yore were alive today, I would be kissing the ground they walked on. Not for a bag of gold coins (alas) but for having left behind a rich cultural heritage for us to be a part of, and enjoy. Historical sites are wonderful places to visit on a lazy Sunday afternoon. You can still laze under that tree there, worry not, as your kid runs around kicking a ball or catching butterflies. 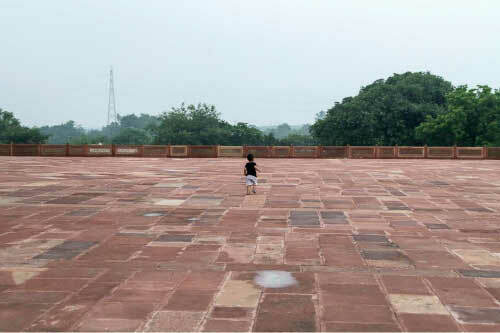 If Mr. ASI allows a little picnic in a certain patch of the Mughal gardens, why not! And if your friends and their tots want to join, the more the food, the merrier the souls! Monuments offer the advantages of the outdoors and the novelty of showing your children what they do not get to see anywhere else – walls made of rocks and domes made of gold, splendid gateways and carved doors. (Of course, it helps to keep them informed that though their daddy is as good as a King, these can under no circumstances be reproduced at home, fuss or no fuss.) The freedom to climb ancient stairs, peep through beautifully inlaid railings and go ‘wow’ at the huge magnificence of these relics of yesteryear is something you can do as a family. Initially, my son would simply roll on the grass, attempt his crawls and excavate the holes in the floors with his tiny fingers. Recently, without being prompted to, he ran to put into the bin a packet of chips someone had tossed on the immaculately clean grounds. I then realised how every place has its own way to make these young minds pick up lessons which perhaps sound too boring within the four walls of our homes, but a fun activity when done in different surroundings. Your child may not come home knowing Babar from Humayun, but he will surely come back happier and more aware of what monuments are all about, and pigeons too! On top of that, if you too are monument-ally crazy parents like we are, you would have successfully sown a little historical seed in his tiny mind. Who knows what it may germinate into? Now, most of them are very badly maintained. Sometimes, it is difficult to tell whether the colour of the artifact was originally a pale grey or is now that, considering it was last dusted 200 years ago. However, my experience of museums vis-à-vis a toddler has been quite encouraging. For one, there is variety there. Gallery after gallery holds newer sights for the children to see and enjoy with wonderment. Generating wonder and awe, even if of the wide-eyed kind, is a beautiful way to encourage your child into newer aspects of life. Two, curiosity is born and it’s a great thing for learning since it encourages the act of questioning – even if it’s a 2-years-something saying ‘What’s that?’ and forgetting the answer the next moment (no matter how hard the parents had to scratch their heads to answer right and be understood). Also, respecting the law of the place by keeping those volumes down and maintaining decorum are little lessons they may pick up as you go museum hopping. So then, while the principles of oscillation behind the moving pendulum exhibit at the National Science Centre went unnoticed by my son (thank God! ), the announcement ‘It’s like a tick-tock’ made me happy for the association that he made on his own. Ever since then, he has been bent on knowing how to tell the time. And all the tricks and sweat that are going into making this feat possible is material for a whole new post, seriously! So, they may come home with a baggage of queries after that museum visit, but you know as well as I do, we don’t mind those questions coming, do we? And I say why not! Wish Growing Up Was Optional! !